Sour cherries are one of the most famous Toschi's products. Only the very best black Sour cherries are carefully selected, stoned and sweetened. 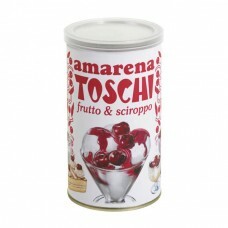 Toschi Amarena Cherries are ideal as a garnish for desserts, cakes and ‘semifreddi’ (ice-cream cakes). Why not create your own special ice-creams and milkshakes? And don't throw away that delicious syrup once the cherries are finished! Use it to flavour Ice creams, refreshing sodas and long drinks.